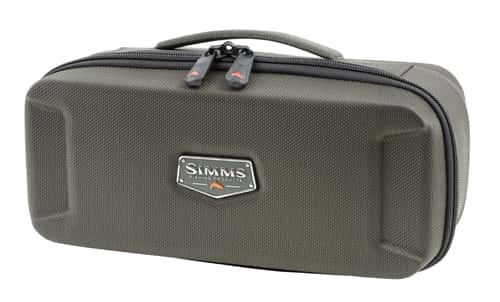 Simms Bounty Hunter Case-MD is built from indomitable 1680D dobby ballistic fabric with a water-shedding DWR finish. Padded, configurable dividers safely house up to six (small) reels. Compression-molded exterior architecture bucks abuse while in transit. And an interior zippered mesh pockets keeps leaders and lines organized. Well constructed, strong zipper and pleasing colors. As with all Simm's products, it is fully priced, but should last years.